A marriage venue is as important as marriage itself. An ideal wedding venue sets the mood for the wedding celebrations. It showcases the chosen theme and couples expectations from marriage. As they say wedding are arranged in heaven but celebrated on earth, before deciding a marriage venue a lot of things have to be taken into consideration like number of guest, dinning and other essential things like parking. The easy accessibility is also an important factor. A marriage venue is an essential part of the wedding celebrations. It reflects the wedding theme and shows how lavish or simple the celebrations are. It must be chosen with a lot of thought and care. A marriage venue is chosen depending on the number of guests that are invited. Depending on the size requirements you can make a survey of the neighborhood areas for a perfect marriage venue. It is advisable to book the venue weeks in advance as there is always a rush during wedding seasons. The most common places of marriage venues are community halls, marriage halls, banquet halls, large parks, open air grounds, temples, churches, clubs and farm houses. There can outdoor and indoor venues depending on the season and Indian climatic conditions. There are some exotic venues like Royal Palace Weddings which can be arranged in some of the exotic Palaces of Rajasthan, Jaipur, Jodhpur and Jaisalmer giving a royal experience to your special day. There are beach weddings arranged on the exotic tropical paradise with wide stretches of silvery sand touching the azure blue seas. There are backwater marriage venues and marriages on cruises further adding a unique and special touch to the wedding ceremony. 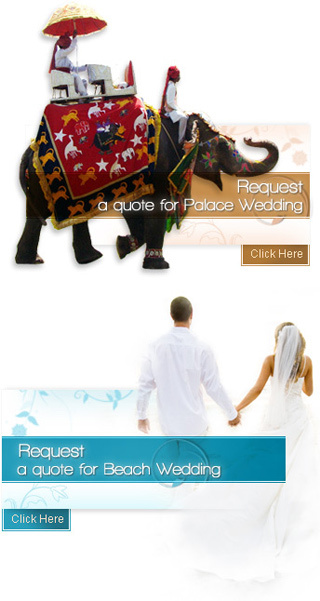 The range of marriage venues is large depending on your choice and budget. Marriage venues in India have become very popular today especially with celebrities coming to India particularly to experience the rich and diverse cultural themes. The exotic marriage venues in Rajasthan, Goa, Kerala and Gujarat offer a lot of varieties at reasonable prices as compared to other parts of the world. Besides the Indian wedding ceremonies are elaborate and the music and food are an indispensable part of the Marriage making the entire experience a joyful and pleasant one.